KEEP YOUR SHOW LIVE, WITH GENERATIVE GRAPHICS, AUDIO REACTIVITY, AND RESPONSIVE TRIGGERS. Get up and running in minutes with 40+ built-in scenes. Built-in audio algorithms automatically turn music into visual action. 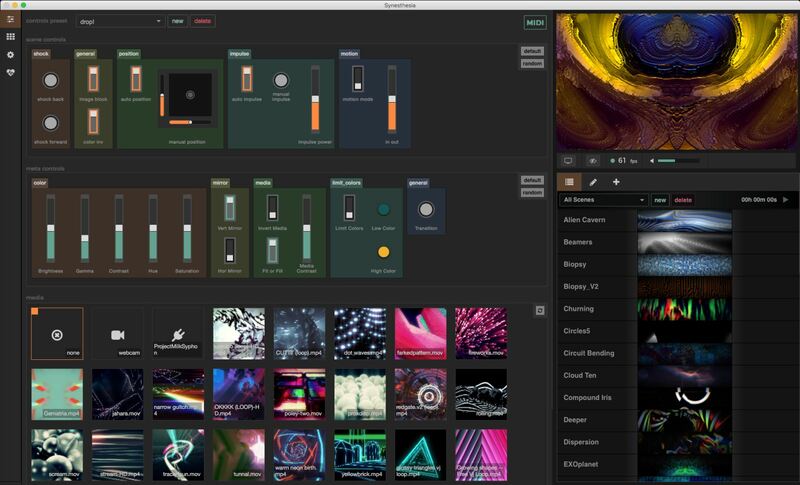 Powerful, midi mappable controls over visual effects. Import your own images and videos to transform with shaders. Shader importing to add fresh content to your Scene Library. Syphon support to integrate with any other VJ software. Creates real-time video output to send directly to a projector. VJS, CREATIVE CODERS, AND MUSICIANS HARNESSING THE POWER OF PIXEL SHADERS. Shader artists wield GLSL to create complex generative scenes, shared with the community. Each scene has a unique aesthetic, control panel, and reaction to music. Live coding environment built-in to easily tweak controls and audio reactivity. ISF and Shadertoy automatic converters to build your library and remix content.